Tuvimos un fin de semana maravilloso! We arrived in Granada via bla bla car at 9:30 in the morning on Saturday. The first thing we did was take a stroll up the ‘Carrera del Darro’. This is a narrow, picturesque, cobblestone street that runs parallel with the Darro River. It is a very old street with a bunch of ancient bridges and a great view of the mountainside. We were in search of the nun with the cookies! I had heard from several reliable sources about these semi secret, highly sought after treats made exclusively by a group of cloistered Spanish nuns. These particular nuns are trying to avoid the general public. We walked up and down several narrow, cobblestone streets with stairs stopping several times to ask various people for directions. 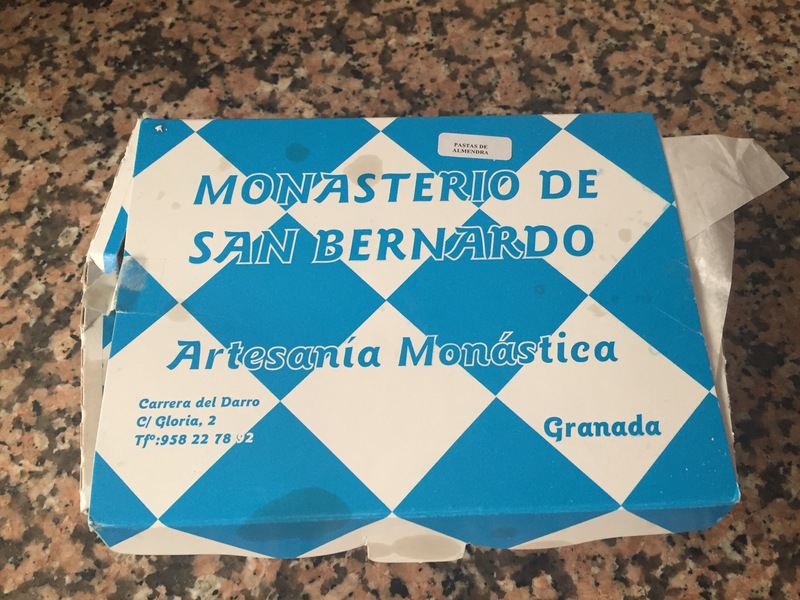 I had heard that the nuns were located at the ‘Monasterio de San Bernardo’. We finally stumbled upon a three chambered lazy susan and a door bell, both built into a wall of the monestery. There is a sign on the wall with directions as to what to do and a list of the different varieties of treats that we could order. We looked at each other and than I rang the bell. After about 3 long minutes, a nun peeked out from behind this lazy susan ! We placed our cookie order and put the money down. About 5 minutes later our cookies appeared! It was quite the experience. The box of cookies we received from the nun. We were than off to ‘The Alhambra’ and the ‘Generalife’. The Alhambra is a massive palace and fortress complex located at the foot of the Sierra Nevada mountains. The 1st historical documents known about the Alhambra date back to the 9th century. However, the 13th century marked the Alhambra’s most glorious period. 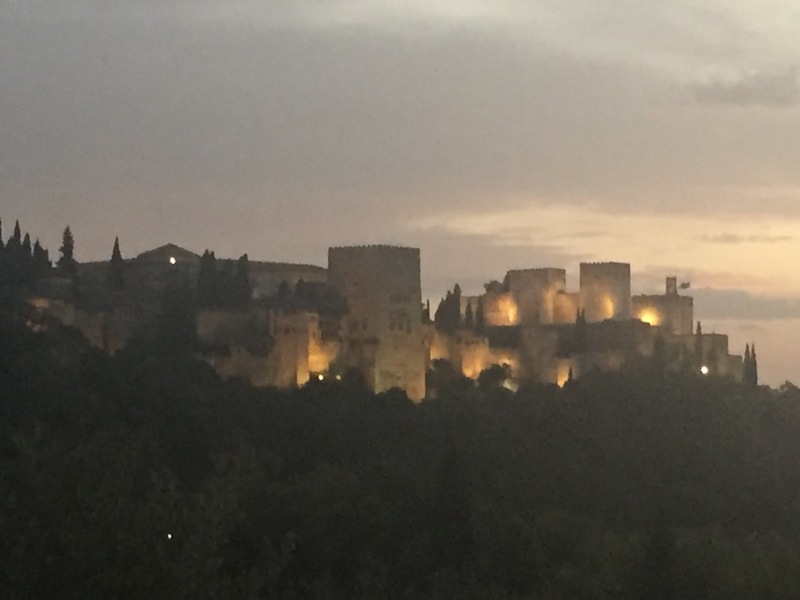 Than in 1492, after the Christian Reconquista, the Alhambra was surrendered to the Catholic monarchs. 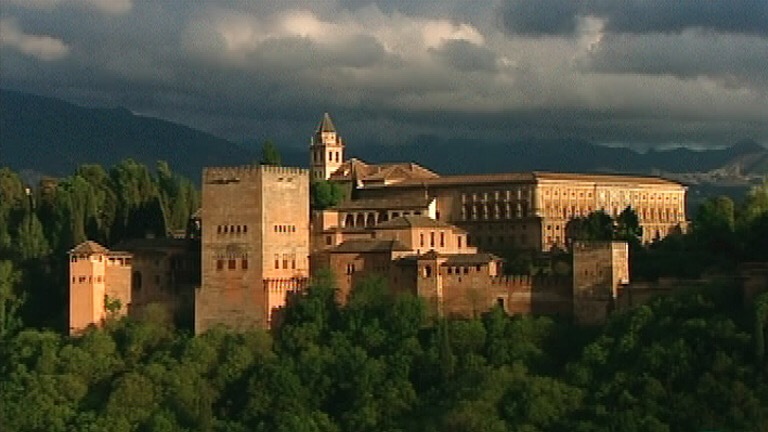 Isabella of Castile and Ferdinand II of Aagon than made extensive repairs and installed the Royal House and the headquarters of the General Captaincy of the Kingdom of Granada in the Alhambra. This is where Christopher Columbus received royal endorsement for his expedition. The last Emir (an Emir is a Muslim ruler) of Granada was Boabdil. There is a famous legend about him and his mother the Sultana Aixa al Hurra (the honored). No woman in history fought like Aixa to save Granada. However Queen Isabella was determined to conquere Granada. And she did in the year 1492. Isabella went to see Boabdil to get the keys to The Alhambra and noticed that he was crying. It was at this time that Aixa looked at her son and said the famous words “Do not cry as a woman for what you could not defend as a man”. View of the Alhambra taken from Sacromonte. 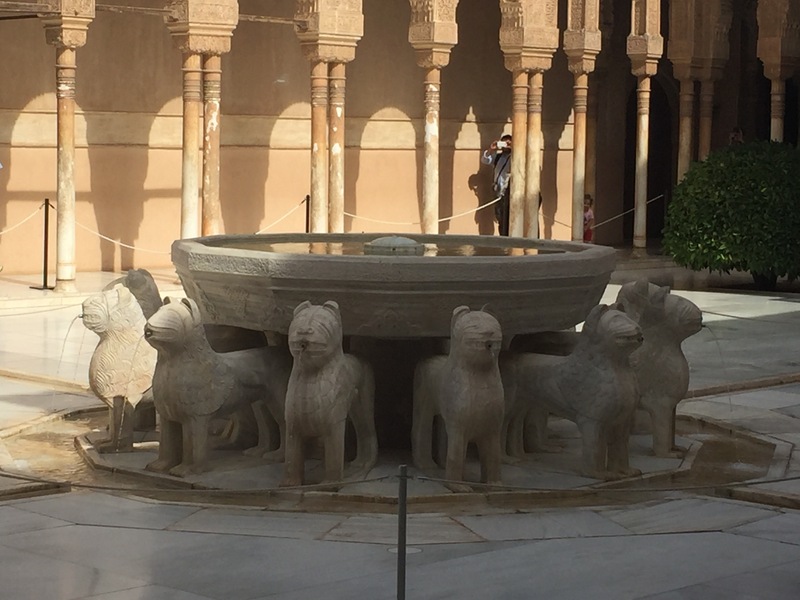 ‘Patio de los Leones’ located in the heart of the Alhambra. Picture taken from ‘Torre de la Vela” in the Alhambra. MaryCarmen and I on the wall of ‘The Patio de Arrayanes’. 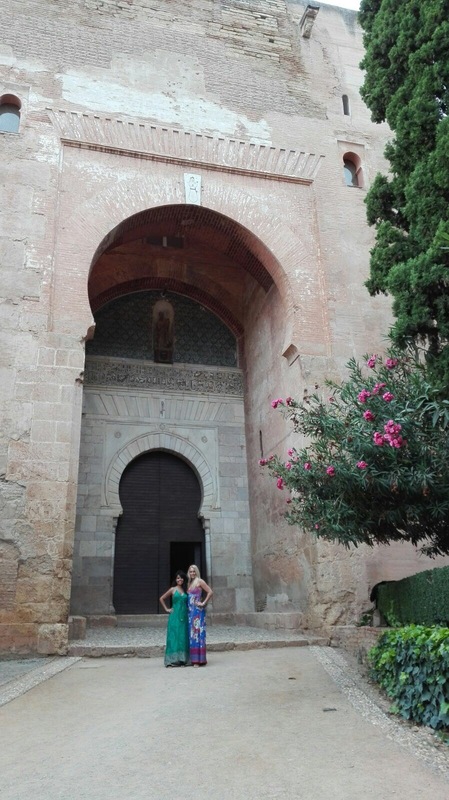 We walked around The Alhambra for over 3 hours and it is truly amazing. MaryCarmen and I standing under ‘The hand of Fatima’. We than decided to take a walk to Sacromonte. Sacromonte is a neighborhood in east Granada. After the fall of the Moorish empire in the early 1500’s, the Roma arrived here and carved cave homes into the hillside. There is an entire population of gypsies (with a lowercase ‘g’)that make their homes out of these abondoned caves. Most of the caves have electricity. Flamenco shows inside of these caves is an extremely popular tourist attraction and goes until all hours of the night. It has been another productivo week! With the help of MaryCarmen, I was able to scratch several things off of my list. I joined my new gym and it is just as nice as my gym in Boca, and only 1/8th of the price per month (and the men in this gym aré especially good looking). I learned how to take the autobús both to and from school. 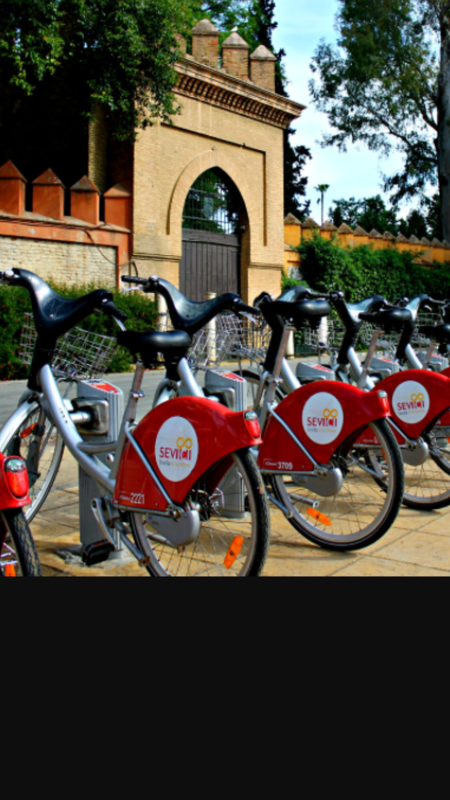 After signing up, I am now the owner of a Sevilla City bike. I found several new markets to do my grocery shopping. Oh and I bought 25 beautiful higos for €1.70!! This would have easily cost me $50.00 back in the Estados Unidos. We changed the language in my phone to español. Poco a poco I am getting organized over here. And, I think the time has come to tell you about my elbow. Do you recall my first day of escuela when I fell on my way there? Well I really did a number on my elbow. Two days after I fell, I noticed that it was very swollen and looked deformed! Due to my limited ability to communicate and the fact that I did not want to inconvenience anyone, I was completely avoiding going to the doctor. Than Raquel put her foot down and made the appointment for me. And than when the day came, she escorted me there herself. The doctor told us that I have bursitis. This occurs as a result of trauma to the bursa causing it to fill with fluid. It is a common sports related injury. The doctor aspirated the bursa with a needle and then injected cortisone. I must admit that I did experience some culture shock going to this private hospital. I want to spare you the details, but I think you can imagine. 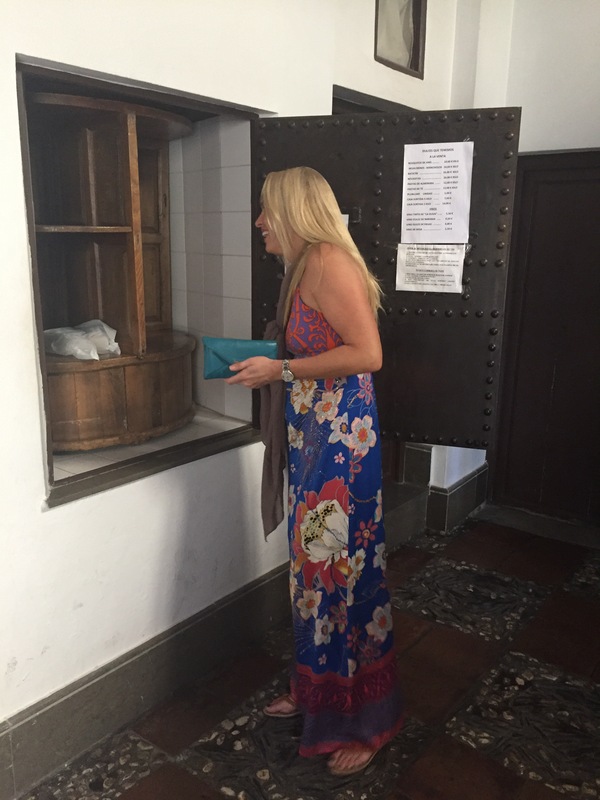 And than when it came time to pay, it’s cash only-no tarjeta (credit card)! We left and hoped for the best and I’m pretty sure that we both thought that this whole ‘bursa’ situation was over with. Well, not even 24 hours later, my elbow was swollen even worse than before!! Raquel made me another appointment with the same doctor and this time I went solamente. Basically, the same procedure was performed only this time 3 nuns stood in the room with me! All three of them dressed in their nun uniforms with their veils, all having a conversation with the nurse and Doctor. All five of these people talking so fast that I have no idea what was going on!! In an effort to make this long story shorter, I have now been to the hospital three times and my arm is wrapped and in a sling. Gloria has now took a stand and is literally waiting on me hand and foot. For those of you that have not met Gloria, she is a force to be reckoned with and I walk very carefully around her. When it comes time to eat, she serves me my food and than stands over me carefully cutting everything into bite size pieces on my plate. She simply refuses to allow me to do anything with my right hand. I was complaining that the original sling was muy calor so Edgar brought over a new one and Gloria came upstairs to my room and helped me put it on. I remember when I was 12 years old and I fell off my bike with Melissa Striuli. I flew over the handle bars and landed on my head. I knocked myself out and Melissa grabbed my legs and dragged me out of the street. A nurse was watching the whole ordeal and brought me back home and told my mother what happened. My mother handed me a bag of frozen peas and told me to “get outside”. I think I will stay here for awhile! Tomorrow morning MaryCarmen and I leave for Granada. Bla bla car will be here to pick us up at 6:00am. For those of you that do not know what bla bla car is, it works sort of similar to Uber, but with several passengers. It basically connects drivers with passengers willing to travel together to share the cost of the journey. My fare for tomorrow’s journey is €14.00. You just can’t beat it with a stick!! It would cost me more than that to take a taxi to the train station! It is a 3 hour drive by car to Granada. We will arrive at 9:00am. And we return Sunday night. 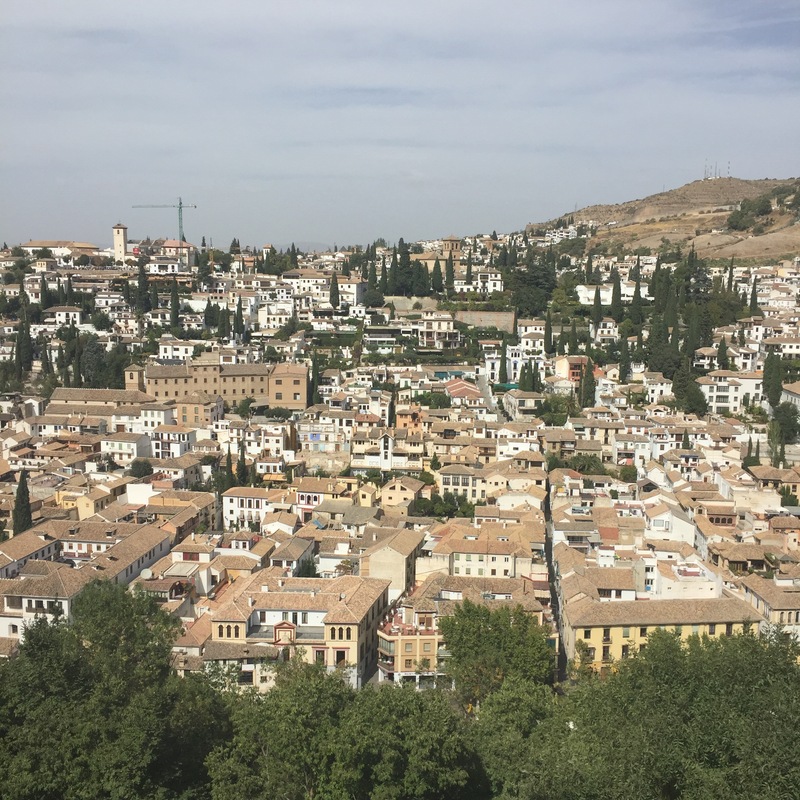 ﻿Granada is located in the Sierra Nevada Mountains and is the home of The Alhambra, one of the world greatest wonders. The Alhambra is a ‘Palace City’ and was declared a World Heritage Site by UNESCO in 1984. 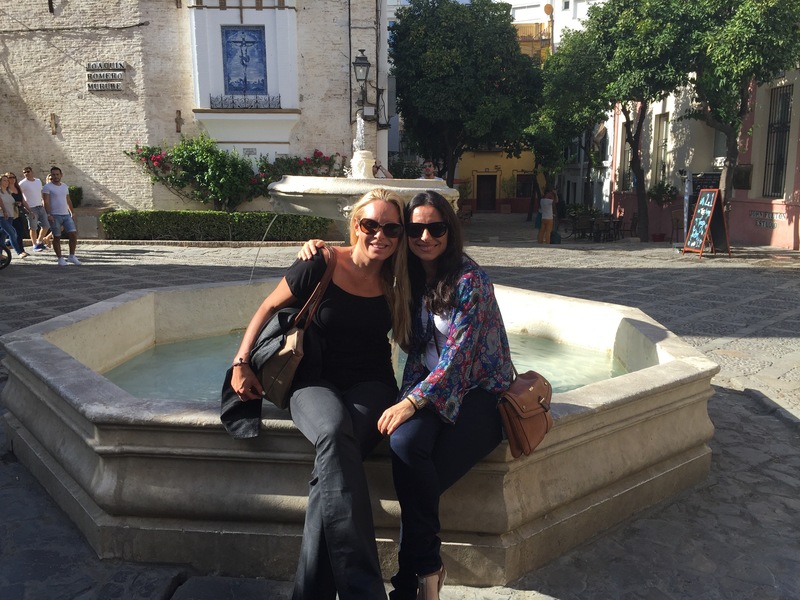 Granada is considered to be one of the three pearls of Andalucia and I am simply thrilled to see this beautiful city. 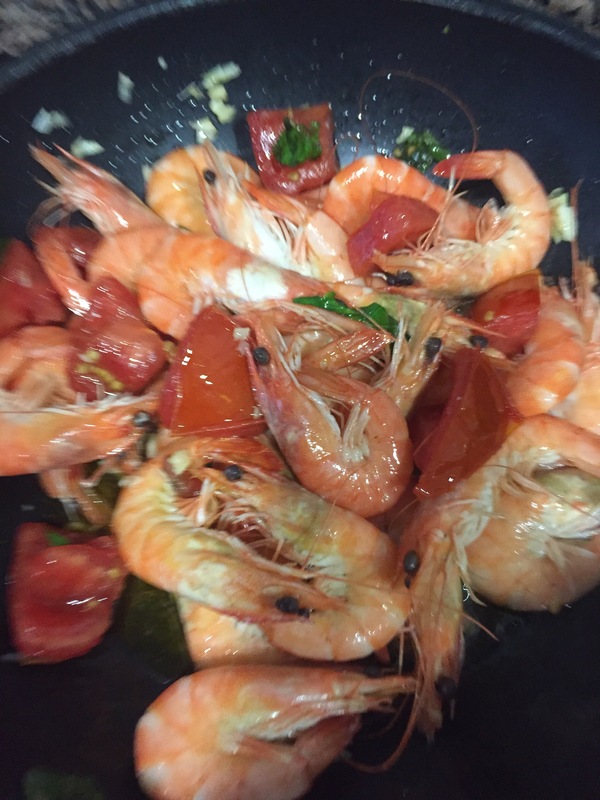 Tonight we are going to plan our weekend, after I cook and we eat my gambas! This weekend started off beautifully and ended beautifully. Pablo was off to Belgium to visit his girlfriend for the weekend. Being the gentleman that he is, he had asked me to teach him to prepare a recipe that he could cook for her upon his arrival. I could go on and on with funny anecdotes about this and how it went down, but unfortunitely I lack the time and space. 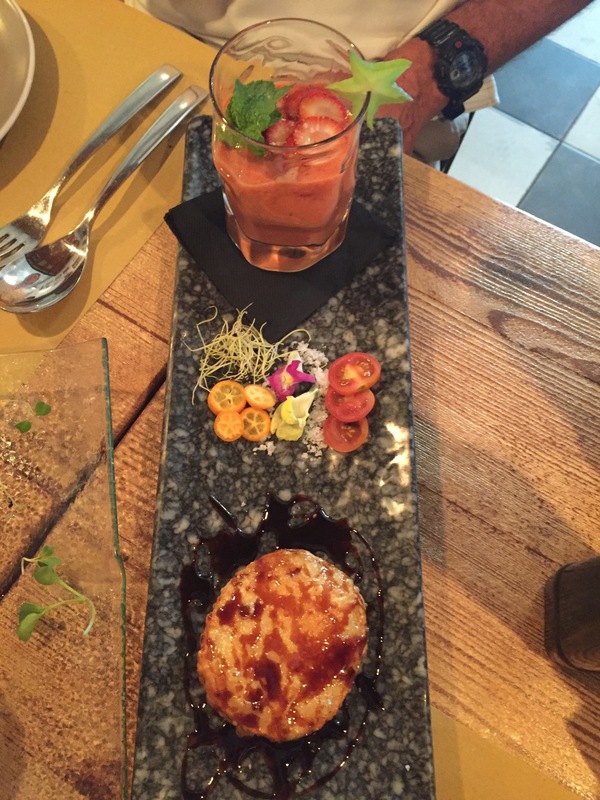 To sum it up, Pablo was a natural in the kitchen and our experiment went very well! I had went to the market and gathered the ingredients to make a pesto. When I arrived back home, everyone in the house was awaiting my arrival. 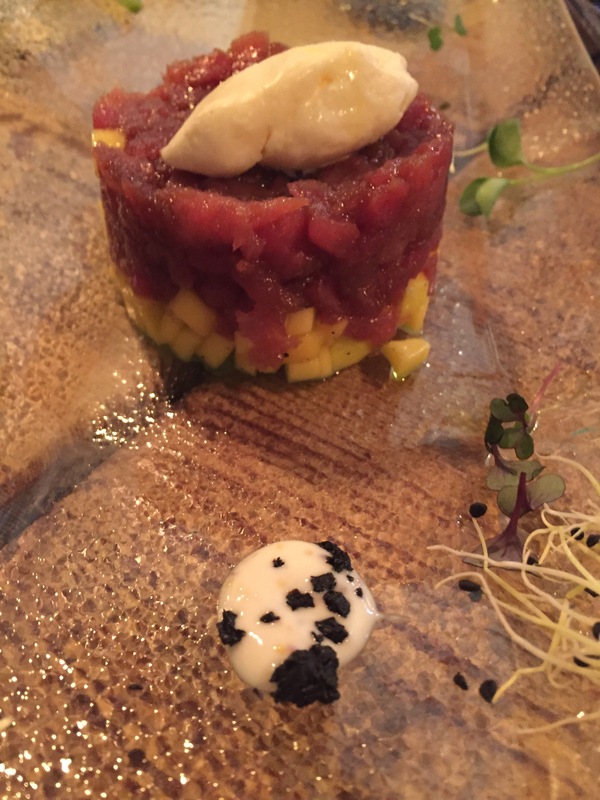 Alejandro started grating cheese, Monica slicing and sauting baby Bella’s, Marta assisting Alejandro with his cheese…All while Pablo jumped from one action to another, ensuring that he would be well prepared. We had a blast and than all sat down to have dinner together. Meanwhile, Edgar has had some sort of a side project going on on the back terrace. It looks like he is building a tool shed of sorts. Edgar is Gloria’s cousin and a super nice man that has showed me nothing but kindness since the day I arrived. Edgar speaks little English and well, my Spanish is definitely under construction. Gloria had officially retired from her job on Friday and so we all gathered for an afternoon torta and cafe to celebrate. Somehow Edgar and I started talking about the procesions and he proceeds to tell me that one was taking place tomorrow (Saturday) at the Catherdal. As soon as I heard this, I immediately canceled my plans to go to Córdoba. That settled it-I was staying in Seville again this weekend, and with joy!! As it turns out Sevilla is the most Catholic city in Spain and Edgar proceeds to tell me that there are over 345 Virgins!! If I could explain to you what this means-I would, but I haven’t a clue. And, I have been trying to get to the bottom of the entire subject of ‘procesions’ since last Saturday. 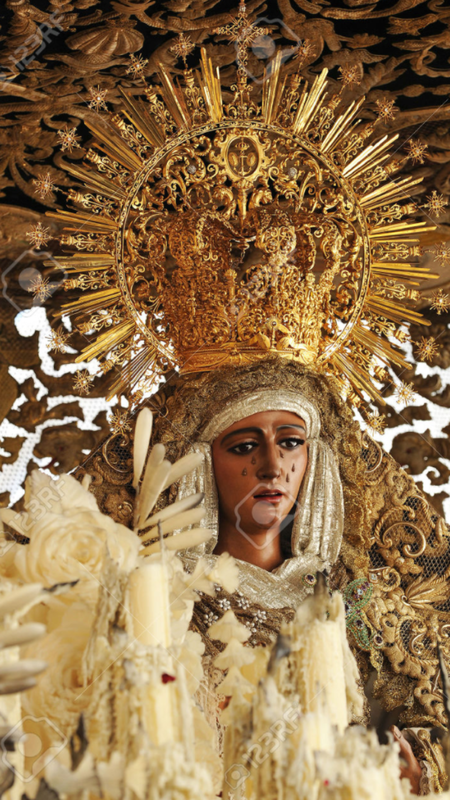 I can however tell you that Maria Santisima, the Virgin of Hope of Macarena, is a 17th century wooden image of the blessed Virgin Mary and is regarded with high respect here in Sevilla. And, I think, she is the sole purpose of the procesion that is going to take place. Apparently, she must be moved from the Cathedral to a church in Marcarena. Edgar explains to me that she is scheduled to leave the church at 6:00 and that I must arrive a bit early to get my spot. I am very grateful for this information. (And, Alejandro, I now know where Macarena is). 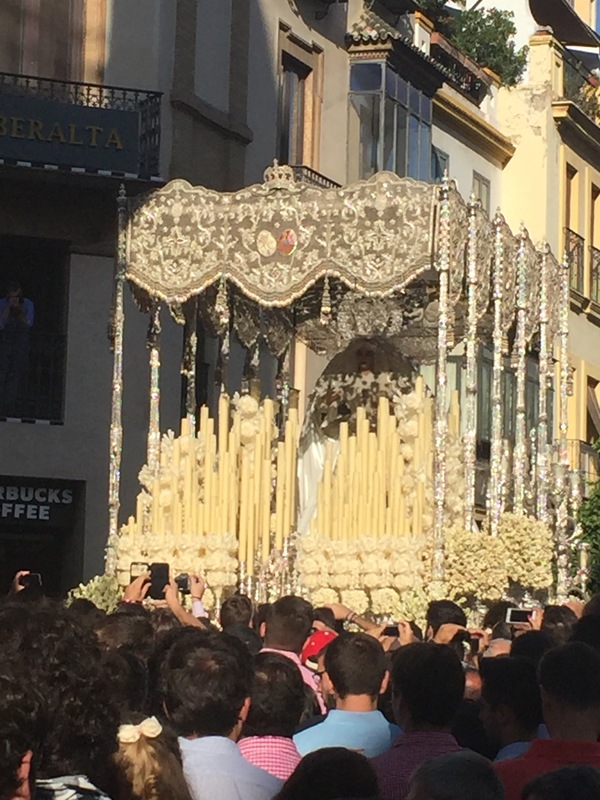 Edger patiently answers all of my questions and I learn that the “float” that the Virgin rests upon is called a ‘Paso’ and that it takes sometimes over a hundred men to carry it. These men spend years on a wait list for this honor. These man are called ‘Costalero’s. The Costalero’s wrap turban’s around their heads and balance the wooden rods on the back of their lower necks. After 24 hours of this, they obviously develop welts from the friction. And, just how the Costalero’s carry the paso is completely different depending on the region in Andulucia. This stance is exclusive to Sevilla. Fast forward to the big day. I go to meet Alfonso for lunch to practice my Espanol and enjoy some tapas and than we head over to the Cathedral. We arrived just in time to see the paso “jump” as the men lower it and this is a breath taking experience in and of itself. The music is loud and beautiful and best of all, I am so close to her that I can almost touch it. This would never happen during Holy Week. 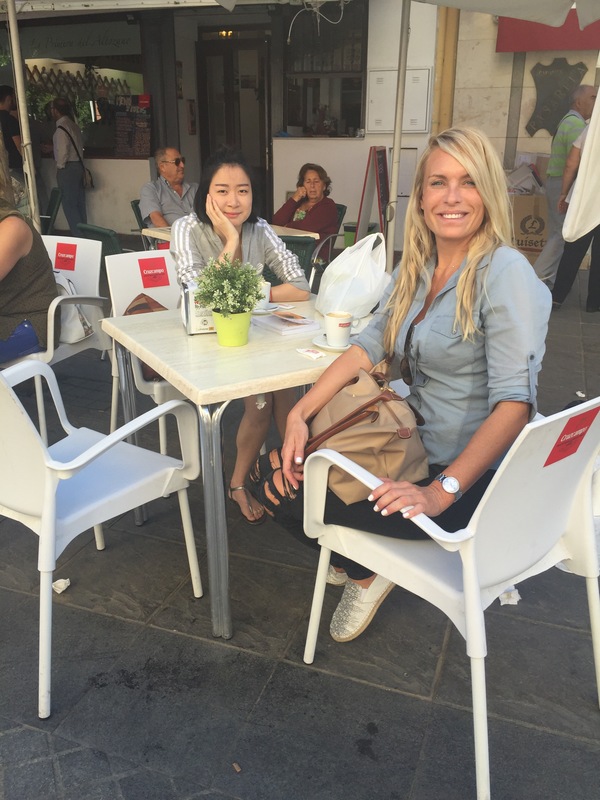 Now Alfonso, being born and raised in Sevilla, knows everyone and we stop to say hello to his lovely friend Ester. 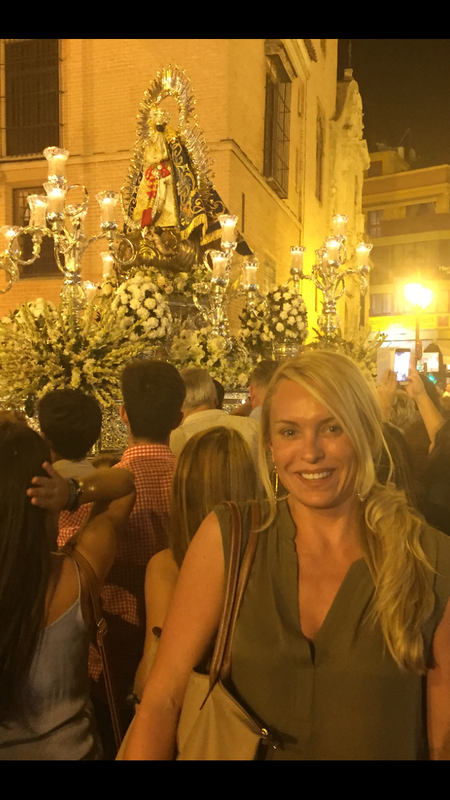 Ester is a Sevilliana and is very funny and is apparently disgusted with this tradition and procesion nonsense. She has me laughing in stitches as she tells me that “the north of Spain makes fun of them and refuses to take the south serious”. She than blurts out “well at least we are evolving and we are no longer throwing goats from the tower”!! WHAT?! Did Ester just say they throw goats from the tower? Not anymore! Yes, this tradition was banned in 2002. Prior to abolishment of this act, a group of men would throw a live goat from the top of the church on the 4th Sunday of January. 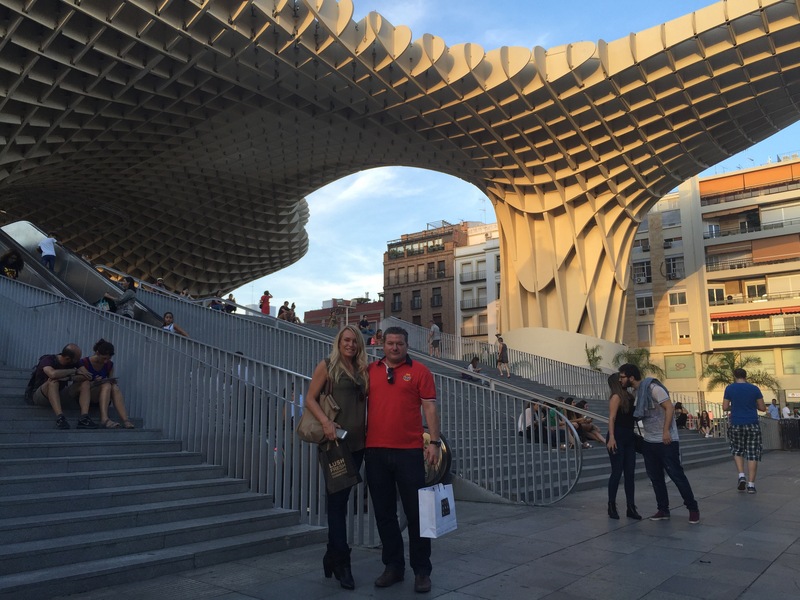 These Sevilliano’s…. I have been here now for exactly four weeks and have yet to visit the famous ‘Las Setas de la Encarnacion’, the ‘Incarnacions Mushrooms’. This is a large wooden structure in the old quarter of Sevilla that was completed in 2011. The architecture doesn’t match the rest of its surrounding areas, as you can imagine. However, these mushrooms sure do attract a lot of attention! Oh and in the midst of the construction, Roman ruins were found and the construction than froze for 14 years while they investigated! Jeez-I thought it took Florida along time to complete a project! The beautiful view from the top of the ‘Setas’ as the sun set. And now back to more procesions!! They continue throughout the entire night walking the streets of Sevilla. Simply amazing. We topped off the night with some more tapas and called it quits around 2:00. The streets were still packed and this considered to be an early night. And, in all the commotion this weekend MaryCarmen had arrived. MaryCarmen is drop dead gorgeous and joins us from Mexico to work on her thesis. She is writing her thesis on ‘Legumbres’. I mean, did I hit the jackpot or what? And, did I tell you that Monica traveled from China with her rice machine stashed in her luggage? These are my kind of people!! When I went downstairs for my coffee this morning, I find a random Chinese girl sitting at the kitchen table. I’m thinking “Oh great. Another girl that I won’t be able to communicate with”. Boy was I wrong! She introduces herself as ‘Monica’. She will be staying with us for a month and speaks English. AND, is here to study Espanol. I need to mention at this point that Gloria’s home is like a hotel! I never know who’s checking in and who’s checking out! I quickly befriend her, thinking the whole time that this is too good to be true! Not only do I have a study partner but a smart, nice one at that! I take her to get her SIM card and her new Spain number. And than we continue running through Sevilla stopping in pharmacies, looking for beauty products, clothing stores, etc. Around noon time my friend Eric from Estados Unidos calls. He is my friend from Florida here to do a bike tour through Andalusia. 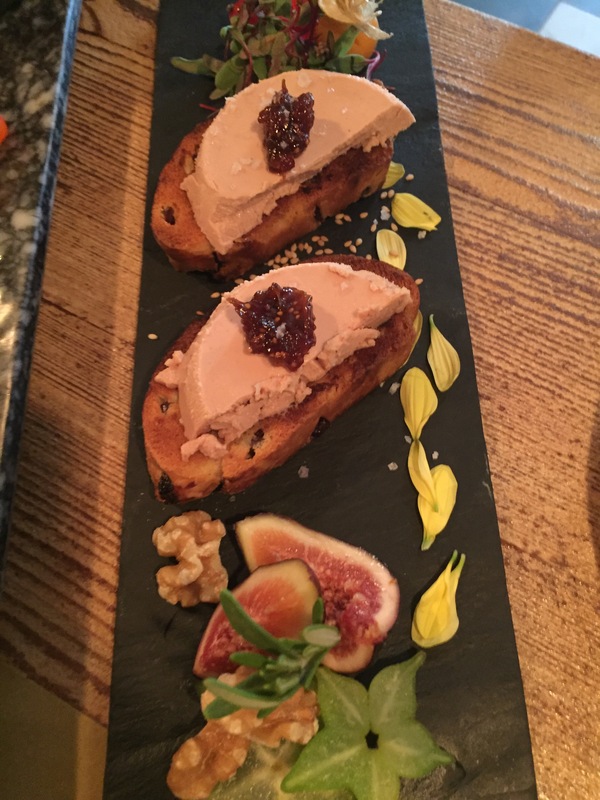 Monica and I skipped across town to get Eric and the 3 of us went for tapas. After lunch, I thought we should start our sightseeing tour at the Real Alcazar. Monica and I headed home for a siesta, stopping on our way to purchase a hair dryer (I’ve been living here for 2 weeks without one). 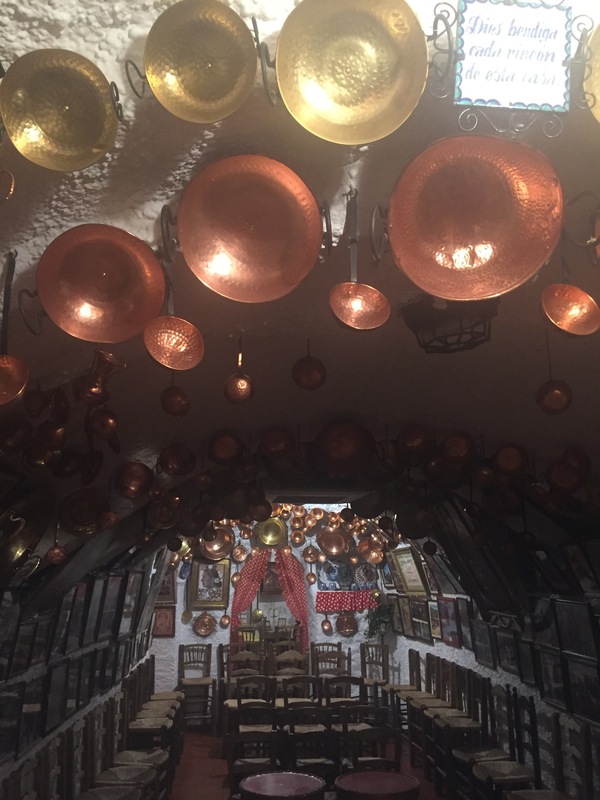 I went back out to meet Eric at Plaza de Espana and than we walked around and ended up a great little tapas restaurant and I had the best dinner that I have had in 2 weeks!